NORMAN, Okla. (AP) — The president of the University of Oklahoma says the school's nearly $1 billion debt is large but comparable to similar public universities. The school's Board of Regents announced Monday that 65-year-old Jim Gallogly (GAL-uh-glee) will become the university's 14th president July 1. He succeeds David Boren, who announced in September that he'd step down in June. Boren is a former U.S. senator and has been the university's president since 1994. TULSA, Okla. (AP) — Oklahoma's former lead seismologist says he felt pressured by a University of Oklahoma official to not link the state's surge in earthquakes to oil and gas production. OKLAHOMA CITY (AP) — The University of Oklahoma Board of Regents has begun the search for the university's next president. The board met Sunday in Oklahoma City, where they accepted President David Boren's resignation. Boren announced last month that he'll step down once his successor is named. He's been the university's president for 23 years. NORMAN, Okla. (AP) — University of Oklahoma President David Boren, a former Democratic governor and U.S. senator, said Wednesday he will resign as head of the state's flagship university at the end of the current school year. Memories of “The Kick” have been shared often by longtime Oklahoma fans this week. As we prepare for Saturday’s OU-Ohio State football game, let’s look at three final stories from the Sept. 24, 1977 game which came down to Uwe von Schamann’s last-second, iconic 41-yard field goal which gave Oklahoma an improbable 29-28 victory. They come from OU President David Boren, former Muscogee (Creek) principal chief George Tiger and an OU fan who gave birth on the same day as the game. IRVING - The Big 12 Conference reported another year of record revenue at its spring meetings Friday, with school officials saying it was proof of financial strength. "No one is significantly stronger than we are in any of the power five conferences," said David Boren, Oklahoma's president and outgoing chairman of the Big 12 board of directors. "We can hold our own with any of them in regard to our financial picture." IRVING, Texas (AP) — The Big 12 Conference reported another year of record revenue Friday, with school officials saying it was proof of financial strength. "No one is significantly stronger than we are in any of the power five conferences," said David Boren, Oklahoma's president and outgoing chairman of the Big 12 board of directors. "We can hold our own with any of them in regard to our financial picture,"
OKLAHOMA CITY (AP) — University of Oklahoma President David Boren is hospitalized after undergoing heart surgery. OU issued a press release Monday saying Boren underwent bypass surgery Monday morning and is "resting comfortably." 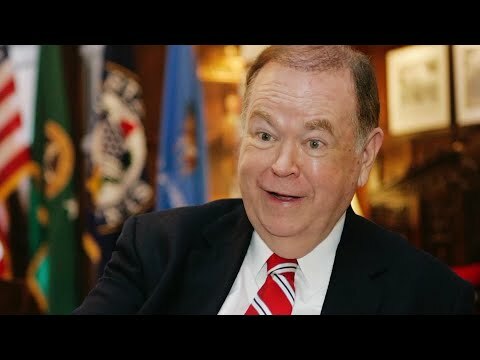 The 75-year-old Boren is expected to remain hospitalized for about a week and then plans to take a few more days off recuperating at his home in Norman. NORMAN, Okla. (AP) — The University of Oklahoma is considering another round of voluntary early retirement offers to faculty and staff as a cost-saving move amid further expected budget cuts. An agenda item for Wednesday's OU Board of Regents meeting includes a recommendation from President David Boren that members approve the Special Voluntary Retirement Incentive. If approved, university officials hope to save an estimated $9.4 million in annual budget costs of the Norman campus. NORMAN, Okla. (AP) — University of Oklahoma President David Boren says the body found in downtown Oklahoma City was that of an OU student. The Norman Transcript reports (http://bit.ly/2lciqxr ) that Boren issued a statement Saturday night saying the man was a student and that university and Oklahoma City officials are working to obtain information about how the man died. NORMAN, Okla. (AP) — Two anti-Black Lives Matter protesters were escorted off the University of Oklahoma campus as OU President David Boren joined a crowd of students and used a megaphone to order the men off campus. The Oklahoma Daily reports (http://bit.ly/2f5S1A9 ) one man called students racist while a second carried a sign that read "BLM Rent A Riot" on one side and "BLM Are Racist Thugs" on the other. NORMAN, Okla. (AP) — University of Oklahoma President David Boren says a student involved in a racist incident at the University of Pennsylvania "is no longer enrolled" at OU. Boren said in a statement Tuesday that the university has "zero tolerance" for those who take part in racism. Boren said OU will maintain a strong sense of community that values and respects all students. Big 12 stands pat and touts unity, but is it built to last? The 10 schools that make up the Big 12 are bound together by a deal committing their television rights to the conference through the 2024-25 school year. GRAPEVINE, Texas (AP) — The smallest Power Five conference is not getting any larger. The Big 12 is staying at 10 schools. After three months of analyzing, vetting and interviewing possible new members, Big 12 leaders on Monday took expansion off their agenda. "This was not a decision to not expand," Commissioner Bob Bowlsby said. "This was an endorsement and reinvestment in the 10 that we had." Boren tax proposal appears headed to the ballot — Good! The last substantial hurdle in the way of David Boren's proposed 1 percent sales tax increase has been cleared. On Monday, the Oklahoma Supreme Court threw out a legal challenge against State Question 779 because it was not filed at the appropriate time. Commissioner Bob Bowlsby has been asked to start evaluating expansion candidates and the league office should already have a stack of files from schools eager for a spot in the Power Five league. The announcement on Tuesday did not say the 10-member Big 12 is committed to expansion, but it is obvious where this is headed.